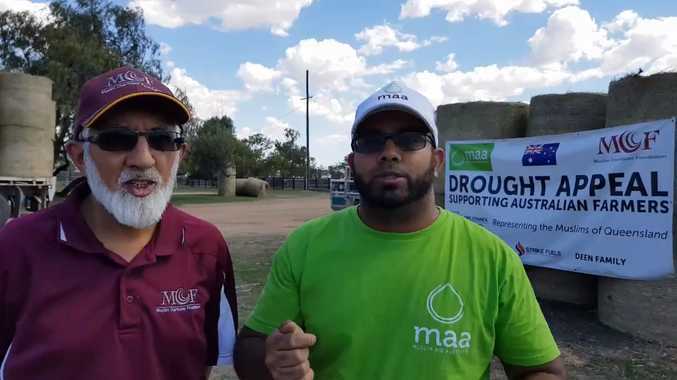 MORE than 33 tonnes in hay bales have been donated to drought-stricken farmers in western Queensland thanks to a charity drive organised by key Muslim groups. The Brisbane-based Muslim Charitable Foundation partnered with Muslim Aid Australia and other groups to truck 132 hay bales on from Gatton in the Lockyer Valley to Goondiwindi on Saturday, passing through the Toowoomba region along the way. In the video posted on Facebook, MCF spokesman Yusuf Khatree said the money for the hay was raised by the Muslim community across Australia to give to those who needed it most. "We've brought with us three truckloads of 44 bales of hay in each truck," he said. "Obviously it's not enough, but hopefully they will distribute it evenly over the next few days so they can feed their animals. "This is going to help them a long way." You can donate to the MAA's drought appeal for Queensland and New South Wales by heading to the website. Muslims donate hay to western Queensland: Muslims donate hay to western Queensland. Facebook video courtesy of Muslim Aid Australia.